Every parent knows that kids outgrow their sneakers so quickly! Sometimes it seems like they only wear them for a few months before they need a bigger size! Smart parents know that these short-lived shoes don’t have to go to the dump. The local thrift shop will be happy to take them, or, even better, a younger sibling may be able to slip into them. But since receiving a pair of obvious hand-me-downs can be less than thrilling to a kid, Green Eyed Monster offers parents a way to revamp secondhand sneakers so that younger siblings will be delighted to wear them! Just send in big bro or sis’s old sneaks, and comic artist Johnny Marra‘s fun and colorful Real_Bot cartoon creatures will make them look so cool that your older kids will be begging to have them back! 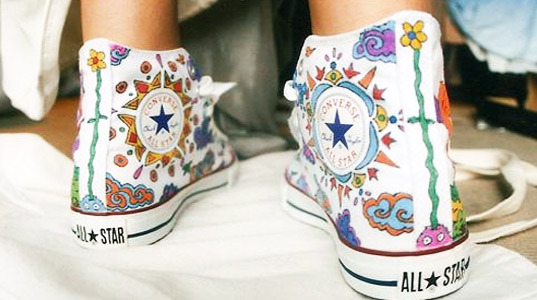 Does your little one have his/her own artistic vision for how they want their revamped sneakers to look? They can tell Johnny all about what colors they like and whether they want the creatures to look scary or friendly. In about a month’s time, your child’s one-of-a-kind shoes will arrive in the mail looking even better than new! Real_Bot sneaker makeovers make a great green gift for the holidays too. And if there’s an even bigger big kid on your list who needs some footwear refurbishing, Green Eyed Monster offers the service for adult shoes as well!